Mail Queues™ - Pye Brook Company, Inc. Mail Queues™ - Pye Brook Company, Inc. 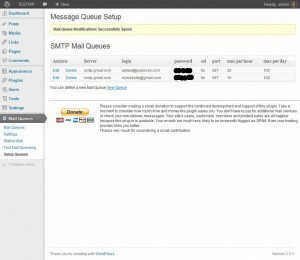 Send mail using SMTP without exceeding the the rate allowed by your mail provider(s). Mail can be sent using multiple user logins/passwords to give fault tolerance and make each mail message somewhat unique so that it is less likely to be flagged as SPAM/UCE by either your or the downstream mail providers. Messages can be automatically reset when the plugin detects Non-delivery messages (NDRs) returned from mail sent by the plugin. 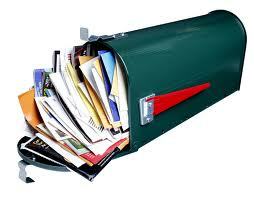 Send mail no faster than the configured number of recipients per hour/day. Keeps you in complience with your providers email sending limits. If you find the Mail Queues plugin useful, if it saves you time, if it makes your customers and your hosting provider happier, please make a small contribution to the continued support and development of the software. Thank you very much for this wonderful plugin! It works like a charm. Question: How does the scheduling work? 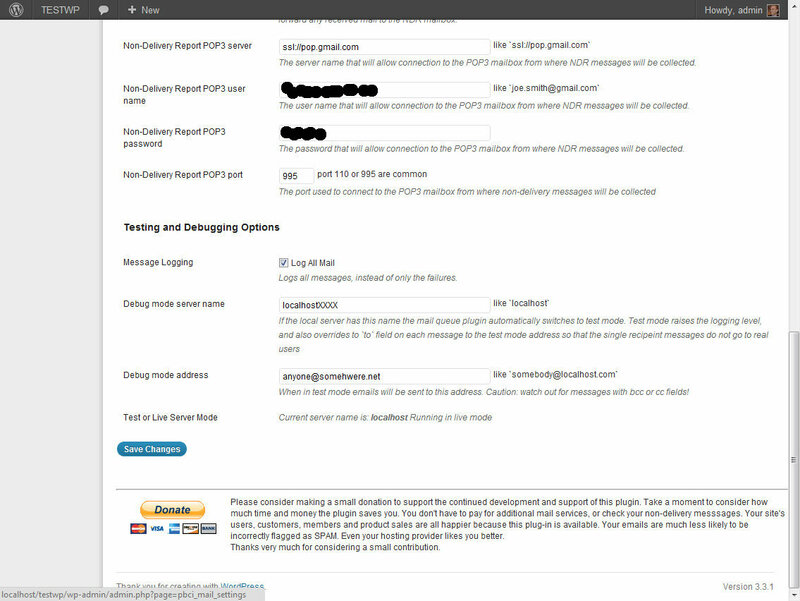 Does it use the wp_cron, ie does the sending of emails depend on the site being accessed by users? I’m Andrew from WebHostingHub. 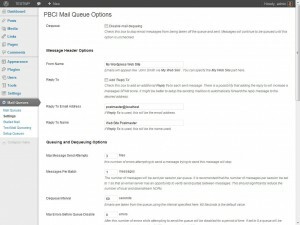 We are doing Spanish translations of useful plugins in order to ease the people from Hispanic community and we consider that your Mail Queues plugin that we found at http://www.pyebrook.com/mail-queues/ is very interesting. Sure, if you give me the translation files i’ll add them to the distribution. I’ve just install the plugin and have questions about the setup and go-daddy. You mentioned it will work and I wonder what setting you used to configure the SMTP to connect to go-daddy. I send 2 test emails but I still haven’t received them it says they’re queued but how long does it take to send them? I appreciate any help you may offer. The emails should send almost immediately. You’ll need to double check the godaddy help pages for the server mail configuration that matches the type of host you have. They place some restrictions on which ports you can/must use to avoid their hosts being used for spamming. Hi there, I am also using this plugin with Subscribe 2. It seems to be working, but they also seem to be sending out at a very slow pace. I’m not that well versed in this stuff, but what settings could I safely alter to send emails out faster? Current settings are: max msg attempts: 3, msgs per batch: 1, dequeue interval: 30, max errors: 0, disable time: 60 min. My max recipients per hour in the queue itself is 500 (I checked with my host and can send up to 700/hour) and 3000 per day. Thanks so much for your help! Experiment with the settings until you start seeing a problem. Increase the messages per batch to 5, then 10 then 15, etc. And decrease the dequeue interval down to 5 or 10 seconds, or even lower. You might also want to adjust the max number of errors up a tick just in case. It shows that the SPF can be tightened up a little bit. The ‘?all’ indicates to the receiving email server that it receives a message from any server on the planet, and the email has a from address that matches an email address in my domain, it’s valid. As a side note (and shameless promotion) check out another site we built and support, (http://www.sparkle-gear.com), they could make your some Dachshund Bling to sell in your store. Haha, thanks so much! I’ll try this. Hello. I am using your Mail Queue with Subscribe2. The Subscribe2 plugin sends e-mail notices in plain text when a new post is added to the site. Many of these posts contain Chinese characters. When I use the Mail Queue at the same time, it looks like it strips out the encode information for UTF-8 and the Chinese characters display as “??????”. I know this is coming from the mail queue because when I disable it the e-mails send fine. How should I edit the code so that the header information for UTF-8 either gets added back in or doesn’t get lost? The error log would indicate that my server is rejecting the emails because they do not have a recipient address. Why is the TO being overridden? How can I reset that? That was the time the plugin was installed. Using ‘Core Control’ plugin the cron for do_mail_dequeue is shown as being a once-off. If I manually run it from there then it is fine but what could be stopping this updating to the next 10-minute run? Looking through the plugin code it looks like the ‘once_off’ is by design. However that means the issue is now with the plugin not actually updating the next scheduled de-queue. Any ideas what I can do to test?! It works when run manually, the issue is only with it not updating the time for the next run. All of my test messages and other messages are being queued, but the cron does not seem to be running to actually send them. 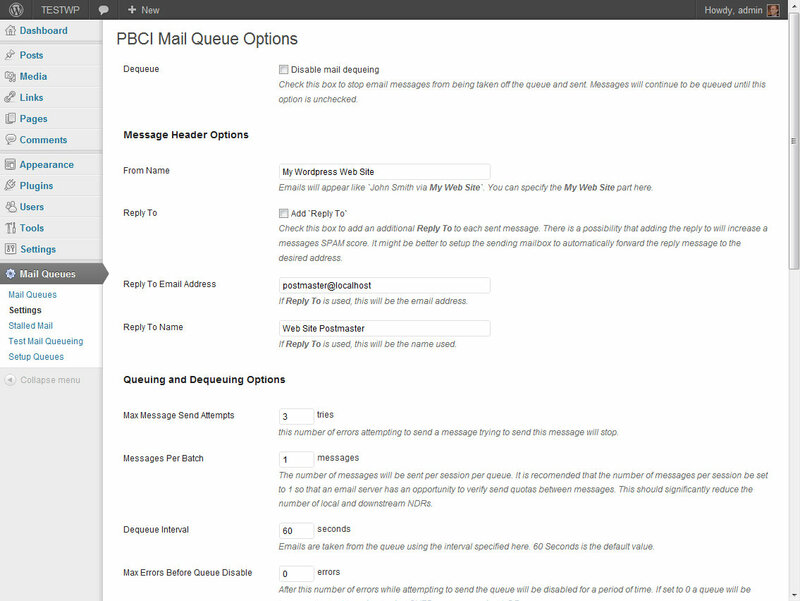 there are 3 test messages from Mail Queue itself, plus two more from other WP mail functions. 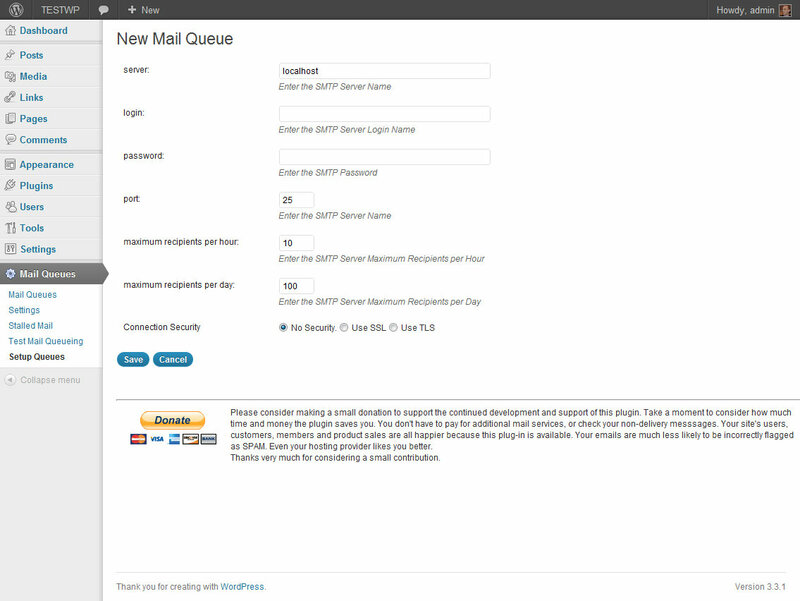 I installed mail queues v 1.0.8 under WordPress 3.5.1 I have deactivates all other plugins, and even gone back to the 20-11 theme. I tried deactivating mail queues and re-activating, but the messages are still in the queue, and the “Message queues will be checked again 0 seconds from now. That is after May 5, 2013, 5:45:07” is still the same. I have checked the settings over and over, but I do not see a place to say “hey cron, get a move on”. I have left the queueing and dequeing settings at the defaults. I would really like to use this plugin; it’s the only thing like it out there, but it needs to actually send messages and not just queue them. Installed v1.08 of the plugin, and having a major issue! 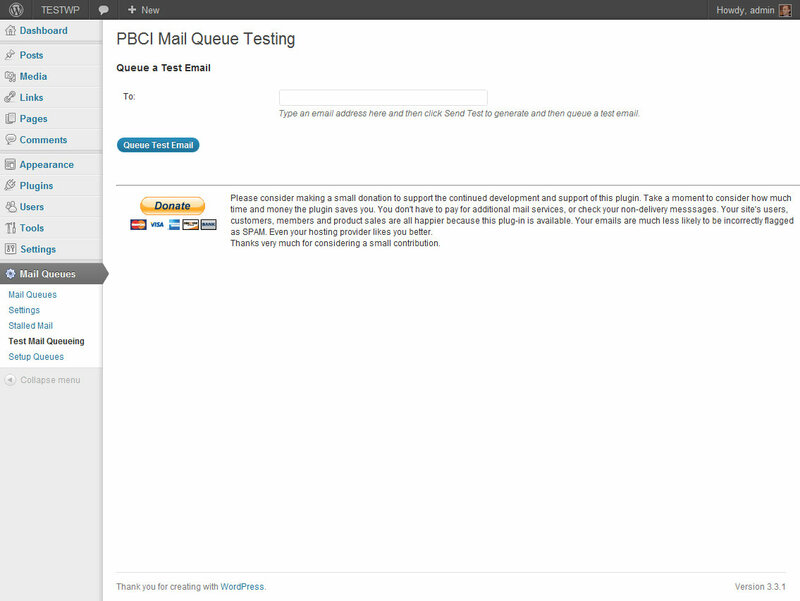 Queue table is created with msg_from NOT NULL column, however when inserting to the table in the pbci_mail_queue msg_from is not set, therefore I get the error WordPress database error: [Field ‘msg_from’ doesn’t have a default value] whenever testing or sending and email! Haven’t heard of this issue before. First thing to check is why a from isn’t being set. 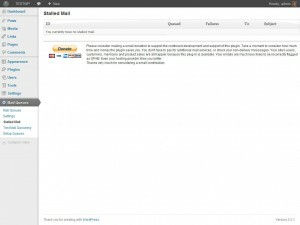 Are the plugin and WordPress mail fields all configured properly? Yup, if you mean the admin email, yes that is setup. 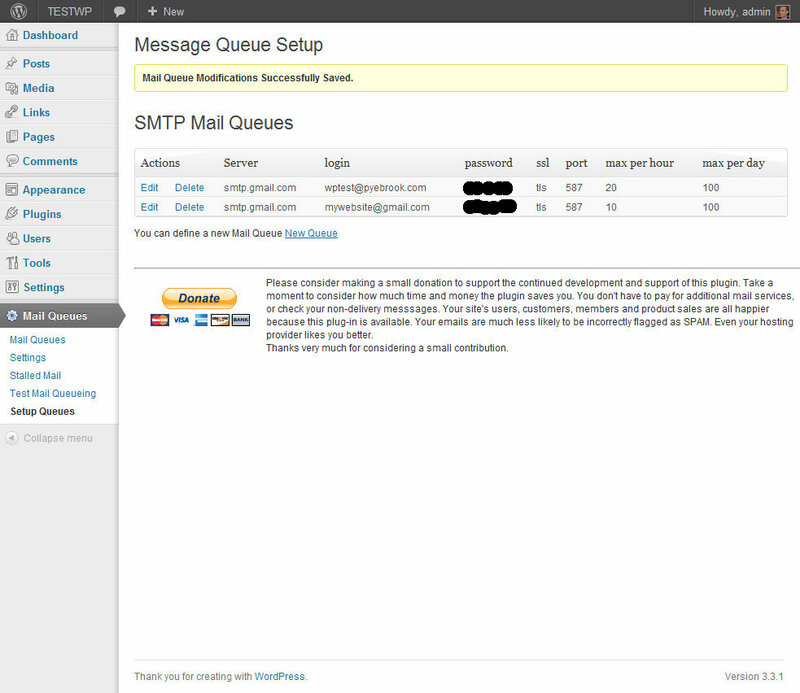 And i’ve also setup a queue before testing (gmail’s smtp). I will try on a clean install, but just by looking at the plugins code you can see the issue, the create table set’s msg_from as NOT NULL, the pbci_mail_queue method does not set the column when saving the email to the queue table, unless there’s some sort of filter/action that is meant to populate it beind the scenes that I may have missed? At this point I gave up and uninstalled it completely! 🙁 Shame cause I really wanted to be able to use it. Check the mailbox that is used to collect the non-delivery messages. It might be that the non-delivery messages are causing the mail to be re-queued? I’ll take another look, based on the WP article it is only a warning generated by the new behavior and does not impact the operation. I’ll post the fix to the plugin repository, here is a reference to the cause of the problem. Version 1.0.7 is live. Let me know if there are any problems. Can I get the same 3.5 version fix for wpdb::prepare() ? Is there a fix in the works via an update or is there something I can do to address this? I appreciate any assistance you can offer. I’ll take a look at it. We have been holding off testing on 3.5 due to the holiday shopping season. I sent you an email with a potential fix. I’m trying to test mail queues to send email through 1and1.com as my ISP. I keep getting failures and can’t figure out why. Is there a log file or something that would help to debug or troubleshoot the connection. Yes the log file should appear in your content or plugin directory when enabled. Setup today on WordPress 3.4.2 and it seems to be working great. The only thing I saw that could use improvement was in the Message Queue Status where it shows last success and last failure, it uses server time rather than taking into account the timezone set in the WordPress settings. Great plugin, thanks. I agree, this would be a good improvement. The only question is the mail headers usually have UTC time, so if we show local time does it make it harder to search the incoming/outgoing messages to find an error when it happens? 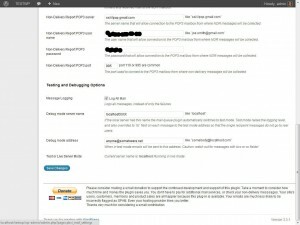 Mail Queues permanantly deactivates the wordpress delivery maschine?!? How can i avoid it or, how can i deactivate the deactivating of the deliverymaschine by mail queues? It deactivates when message counts reach the limits, too many non-delivery messages appear, or the server actively refuses the connection. You can change the code to ignore these conditions, or you can see what is causing the errors. i cant find any support adress, can anyone help? Sending speed is dependent on the server response and the throttle. Keeping things slow helps reduce being flagged as a spammer. i am quite new in this business. Which newsletterplugin works in combination with MailQueues? Any newsletter plugin that is compatible with WordPress and doesn’t override the mail sending functions should work. I tested the settings. It worked. Then, I published a new post and it seemed like the email to subscribers completely bypassed the plugin. Is there a difference between posting (automatically notifying subscribers) and actually emailing? 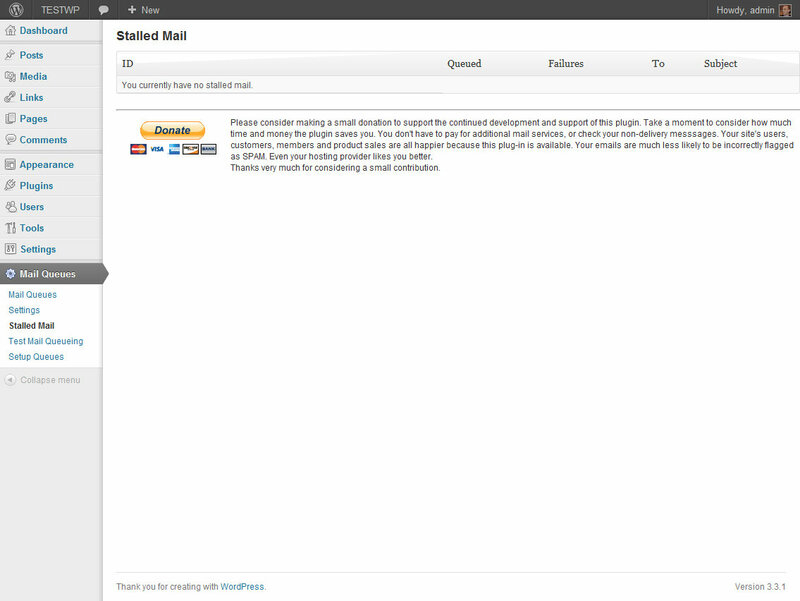 I have MailPress plugin installed. 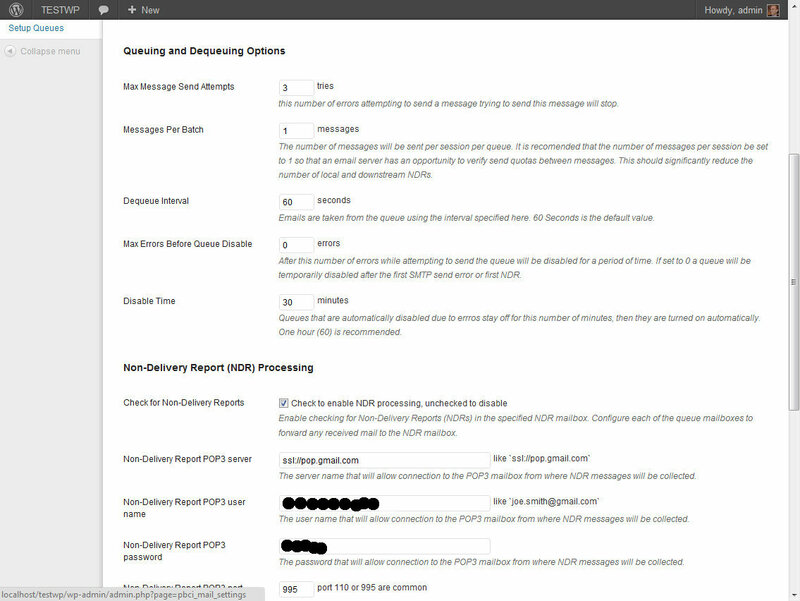 Could mailpress be handling the mail sending? I don’t use it so I can’t tell you. I tested today with a gmail account and look seems no email is send “5 unsent messages in the queue ready to send” I made ​​5 different email addresses tests. I used the plugin last month and it works perfectly, but now that I’m supposed to send the monthly newsletter it stop working at all. I’ve tryed using different mail servers and deactivating other plugins but still no working. I don’t know is there was a change or something but is no longer working. Ah, I see the log files go in the wp-content directory and are named like mail-1.log. Andrew. Excellent plugin – works perfectly for me, so I’ll send a donation soon. Just one thing. I can’t find the mail log file anywhere amongst my site’s files. What will it be named, and in which directory will I find it? Thanks for the quick response. To save a lot of back and forth, if it is any help if you contact me by mail I can give you details of an email account to try forwarded as well to another email of your choice. 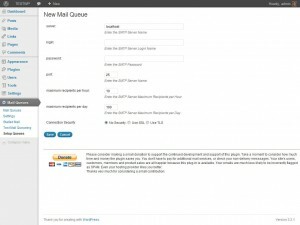 Error on mail queue screen is: Check server and port in Mail Queues Settings Page. POP3 pass: Authentication failed [-ERR [AUTH] Username and password not accepted.] Have checked carefull userneme and password several times. Account works fine via outlook. I’ve installed the plugin for use with Subscribe2. I see emails are sent to the queue but they don’t get sent (I’ve created 2 different mail queues). What’s needed to trigger sending and/or clear the queues? After much testing it seems Mail Queues doesn’t work for a WordPress blog that is password protected by .htaccess. Is there a workaround? Could be the mail log file? Double check that your .htaccess allows the mail queue plugin to write to the log file. Or modify the plugin code to not write to the log file. Firstly, thank you for your (free) plugin. My SMTP server requires the use of ‘AUTH’ to send mail. How can I configure your plugin to use this and how can I enter the AUTH settings? If I use this plugin am I able to disable the e-mail server functions on my web server? I’m thinking if it sends mail by SMTP the same way an e-mail client like Thunderbird does then there is no reason to have any active e-mail services and that would close down a lot of vulnerabilities. 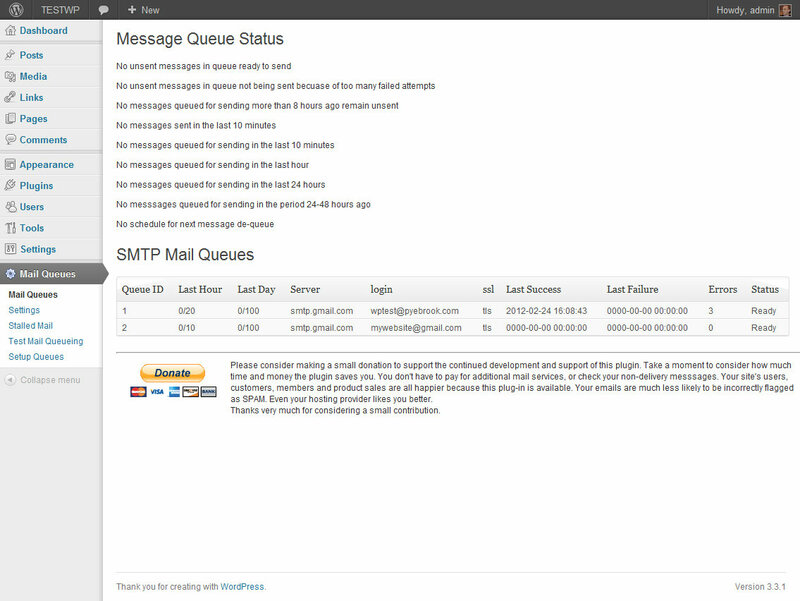 The Mail Queues plug-in does not care where the SMTP services are running. 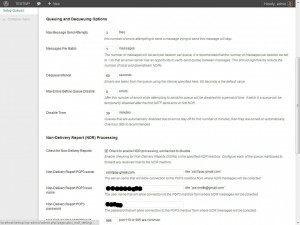 The SMTP connection could be to your own mail server, or your ISPs, or a random third-party like gmail. My experience is that email is more likely to be blocked as SPAM/UCE if your are using a local email server. 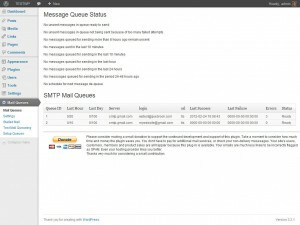 The folks who are running the larger SMTP server put more effort into maintaining their server reputation than most of us could do on our own. Running your own private SMTP server is great because you get control, but problematic if you are running in a shared server environment, or don’t have the time/expertise to manage all of the details that keep your mail server reputation as a valid sender. Of course when you use your ISPs mail services, or a third-party mail service you must behave by additional rules that provider sets. Often these rules include send rate limits, and perhaps having to respond to MTA generated non-delivery reports. That’s why you want a plug-in like Mail Queues. Hi Trying to use mail queue with my blog and hit a problem in that it requires smot authorisation which I unfortunately can’t set with your plugin. Mail is hosted by 1and 1. My outlook emiail client which works with this email account has authorisation turned on and uses port 587. I sthere any other information that will help? I’m guessing you meant smtp authorization? If that is the case the plugin should work. My test system is sending and receiving via gmail and hotmail, both accounts use 587 and require passwords. I’m not sure how to go about finding the cause of your issue?